Today, more than 420,000 childhood cancer survivors are alive in the United States, and one in 750 individuals in the United States is a survivor of childhood cancer. Thanks to advances in treatment and screening for some childhood cancers, 80% of all children diagnosed with cancer survive beyond 5 years. This is indeed a glimmer of good news, but the fight always continues: the treatments that save lives also increase later risks for serious, life-threatening illnesses. These health risks are lifelong, increase with age, and can result in early death. 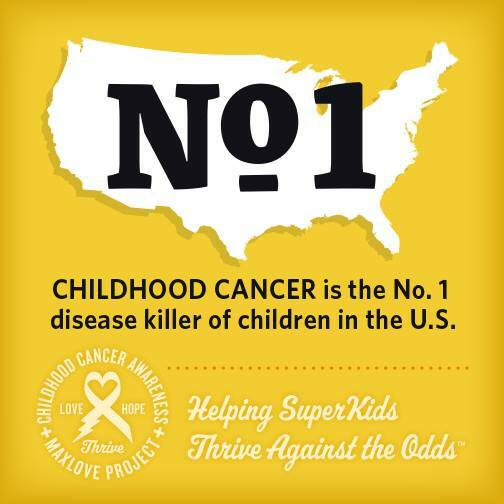 As the largest cause of disease-related death among children and adolescents ages 1-19 in the United States, childhood cancer presents a serious challenge to public health . Fortunately, survival rates for childhood cancer have increased dramatically over the last 30 years due to improved therapies, screening, and protocols. Today, more than 420,000 childhood cancer survivors are alive in the United States, and this number is expected to grow absolutely and proportionately as treatment protocols continue to improve . Because of these improvements, the absolute number of childhood cancer survivors (CCS) has markedly increased, leading to a new set of challenges . This good news of survivorship statistics is counterbalanced by the fact that CCS are at a much greater risk for primary and secondary cancers, a plethora of chronic diseases, and a variety of treatment-related late effects [4,5]. A growing body of research shows that the health risks facing CCS are lifelong, increase with age, and can result in early mortality. A number of the secondary effects CCS face, such as cardiologic disorders, are treatable primarily through clinical medical intervention [6-8]. And efforts are currently underway to raise awareness of the unique follow-up care needs of this population [9,10]. 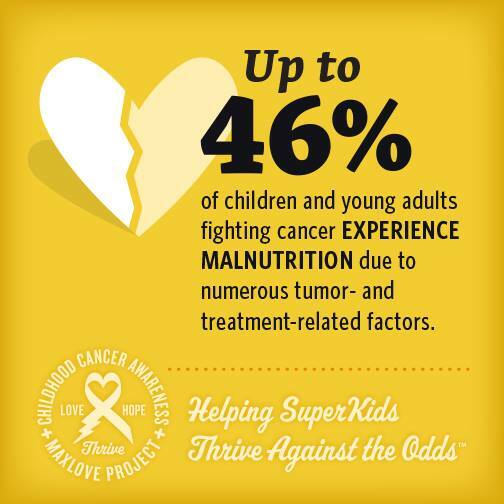 However, many of the most common health challenges faced by childhood cancer survivors, such as Type 2 diabetes mellitus, obesity, metabolic syndrome, chronic fatigue, and reduced health-related quality of life (HRQOL) can be significantly ameliorated through lifestyle changes [11-13]. There is a need for cost-effective, patient-centered health behavior interventions that can aid CCS and their families in making lifestyle changes that reduce childhood-cancer-related risks while improving overall quality of life [2,14,15]. Because conventional survivorship follow-up care is primarily focused on acute disease screening and management, less attention is paid to preventive medicine, self-care, and health behaviors that can improve quality of life and reduce lifelong increased survivorship health risks. This is where MaxLove Project's Be Super Action Plan and targeted interventions come into play. 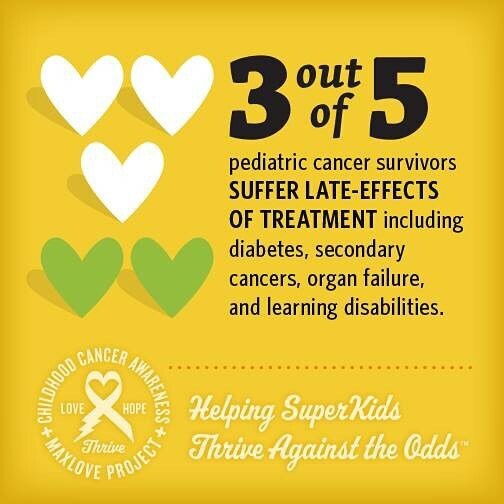 It is our goal to partner with families and medical teams nationwide to change the odds for childhood cancer survivors, as well as for those who face/faced diseases treated in the same manner. We are working to build scalable, evidence-based survivorship programs to ensure that all kids have every opportunity to thrive against these odds. We believe that we can change these odds! 1. Ward E, DeSantis C, Robbins A, Kohler B, and Jemal A. Childhood and adolescent cancer statistics, 2014. CA: A Cancer Journal for Clinicians. 2014;64(2):83-103. doi:10.3322/caac.21219. 2. Robison LL, and Hudson MM. Survivors of childhood and adolescent cancer: life-long risks and responsibilities. Nature Reviews Cancer. 2014;14(1):61. doi:doi:10.1038/nrc3634. 3. Oeffinger KC. Introduction: The Science of Survivorship: Moving From Risk to Risk Reduction.Seminars in Oncology. 2013;40(6):662-665. doi:10.1053/j.seminoncol.2013.09.005. 4. Oeffinger KC, Mertens AC, Sklar CA, Kawashima T, Hudson MM, Meadows AT, Friedman DL, Marina N, Hobbie W, Kadan-Lottick NS, Schwartz CL, Leisenring W, and Robison LL. Chronic Health Conditions in Adult Survivors of Childhood Cancer. New England Journal of Medicine.2006;355(15):1572-1582. doi:10.1056/NEJMsa060185. 5. Hudson MM, Ness KK, Gurney JG, Mulrooney DA, Chemaitilly W, Krull KR, Green DM, Armstrong GT, Nottage KA, Jones KE, Sklar CA, Srivastava DK, and Robison LL. Clinical Ascertainment of Health Outcomes Among Adults Treated for Childhood Cancer. JAMA. 2013;309(22):2371-2381. doi:10.1001/jama.2013.6296. 6. Armstrong GT, Pan Z, Ness KK, Srivastava D, and Robison LL. Temporal Trends in Cause-Specific Late Mortality Among 5-Year Survivors of Childhood Cancer. Journal of Clinical Oncology. 2010;28(7):1224-1231. doi:10.1200/JCO.2009.24.4608. 7. Armstrong GT, Kawashima T, Leisenring W, Stratton K, Stovall M, Hudson MM, Sklar CA, Robison LL, and Oeffinger KC. Aging and Risk of Severe, Disabling, Life-Threatening, and Fatal Events in the Childhood Cancer Survivor Study. Journal of Clinical Oncology. 2014:JCO.2013.51.1055. doi:10.1200/JCO.2013.51.1055. 8. Mertens AC, Liu Q, Neglia JP, Wasilewski K, Leisenring W, Armstrong GT, Robison LL, and Yasui Y. Cause-Specific Late Mortality Among 5-Year Survivors of Childhood Cancer: The Childhood Cancer Survivor Study. Journal of the National Cancer Institute. 2008;100(19):1368-1379. doi:10.1093/jnci/djn310. 9. McCabe MS, Bhatia S, Oeffinger KC, Reaman GH, Tyne C, Wollins DS, and Hudson MM. American Society of Clinical Oncology statement: achieving high-quality cancer survivorship care. Journal of Clinical Oncology. 2013;31(5):631-40. doi:10.1200/JCO.2012.46.6854. 10. Prasad PK, Bowles T, and Friedman DL. Is there a role for a specialized follow-up clinic for survivors of pediatric cancer? Cancer Treatment Reviews. 2010;36(4):372-376. doi:10.1016/j.ctrv.2010.02.014. 11. Nathan PC, Ford JS, Henderson TO, Hudson MM, Emmons KM, Casillas JN, Lown EA, Ness KK, and Oeffinger KC. Health Behaviors, Medical Care, and Interventions to Promote Healthy Living in the Childhood Cancer Survivor Study Cohort. Journal of Clinical Oncology. 2009;27(14):2363-2373. doi:10.1200/JCO.2008.21.1441. 12. Stolley MR, Restrepo J, and Sharp LK. Diet and physical activity in childhood cancer survivors: a review of the literature. Annals of Behavioral Medicine. 2010;39(3):232-49. doi:10.1007/s12160-010-9192-6. 13. Bauer J, Jürgens H, and Frühwald MC. Important Aspects of Nutrition in Children with Cancer.Advances in Nutrition: An International Review Journal. 2011;2(2):67-77. doi:10.3945/an.110.000141. 14. Brier MJ, Schwartz LA, and Kazak AE. Psychosocial, health-promotion, and neurocognitive interventions for survivors of childhood cancer: A systematic review. Health Psychol. 2015;34(2):130-48. doi:10.1037/hea0000119. 15. Ford J, Barnett M, and Werk R. Health Behaviors of Childhood Cancer Survivors. Children.2014;1(3):355-373. doi:10.3390/children1030355.